Dodgeville, Wis. — Kim Meier and his son, Josh, traveled about as far to hunt deer in Wisconsin as anyone in America. They live in Wasilla, Alaska, and come to Wisconsin for the venison, not an opportunity to shoot a large-antlered buck. Kim Meier, now retired and 62, ended his career with the U.S. Army in Alaska and then went to work at the U.S. Postal Service in Wasilla. One might imagine all the hunting opportunities in the 49th state would satisfy his quest for wild meat, but he developed the taste for venison and can’t get enough of it. Josh Meier, Kim’s 37-year-old son, was along on this nine-day trip. He’s been here before, but not recently, so Wisconsin had a deal for him. 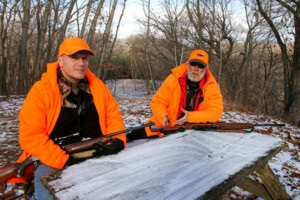 Kim recalls seeing a Wisconsin DNR television clip explaining that new, out-of-state hunters get a break because once they’ve experienced hunting here, they want to come back again and again. After experiencing Wisconsin hunting, they’re then willing to pay the full non-resident fee. Kim understands that. Moose is one of the main wild animals the Meiers hunt in Alaska. The quest for venison is the same every time – hunt hard until the tags are filled and then take the deer to “Uncle Jimmy’s” in Blue Mounds to be cut, ground, wrapped and frozen for the 3,500-mile trip back to Alaska. Their clothes and guns take up two luggage items and venison the third, at a cost of about $150 for that third item. The trip for Kim Meier and his son will cost them about $2,000. The thrill of hunting here is the craftiness of these white-tailed deer. Weather is about the same here during deer season as it is in Alaska where the Meier’s live, sometimes even colder here, and then winter sets in. The Meiers are enamored with other wildlife, too. Two years ago, a bobcat walked up to Kim Meier; this year it was a coyote – and a chipmunk that came calling two consecutive days. The last time Kim thought the chipmunk was being overly noisy, but when he turned around it was a deer doing all the leaf-rustling. On the first Sunday, the Meiers were sitting in their stands when a herd of 30 deer ran past. They compared it to caribou in Alaska.